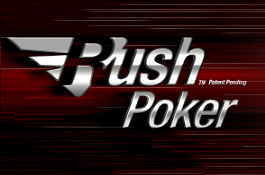 Rush Poker is a new feature which has been added by Full Tilt Poker. This is not a poker variant but it’s a way of playing poker which is extremely fast and it is available for Hold’em and Omaha. Players are placed in a pool and the pool can consist of hundreds of players. Once in the pool, when you are playing your game as soon as you fold your hand you will automatically be given a new hand, new table and new opponents which have been picked from the pool randomly. You will never get to play with the same opponents twice in a row. A successful Rush Poker strategy requires very tight play, as explained below. Rush Poker is a game full of extreme action and if you are a poker junkie then you will certainly love this game play. The game has a feature such has the quick fold button at which you do not have to wait and see how the other opponents played their hands. As soon as you fold your hand you will receive a new one instantly but this kind of poker game play encourages tight playing at which you would not know what type of opponents you are playing with. Rush Poker is very simple to play and adopt your own unique strategies especially if you are an experienced poker player. While playing the game you can easily figure out that this is a real tight game. You do not have to take chances if you have a weak hand. All you have to do is fold the hand and get a better one instantly. This is one factor that has been noticed by the experienced players. The game play is very tight and it has been observed that less than 20% of the players reach to the flop. Most players do not even try to continue game play if they have been given a weak hand. Hence, when a player raises this would mean s/he is holding Aces or better and the rest of the players would have to throw away their cards due to the fact that the game play is not similar to the regular games. Another factor is that Rush Poker does not work with poker software tools such as PokerTracker or other hand history tools. There is no much difference from the regular poker games. All the rules are the same but the only difference is the winning strategies. Update March 2012 – Full Tilt Poker is no longer a safe poker room to play at. After the Black Friday incident in 2011, they were forced to withdraw from the United States. Once this happened, it became known that they had money issues and could not pay back the US players. On the other hand, PokerStars quickly paid back every person that was at their poker room from the United States. This shows just how far ahead PokerStars is to even the 2nd largest poker room at the time. PokerStars has now released their own form of Rush Poker called Zoom Poker. They basic Zoom Poker strategy is all the same and you have a larger player pool than you did at Full Tilt. This article was submitted by my friend Josh. I made some edits, but he did the most work.